This species is widespread in eastern and central U.S. and Canada, occurring from the Great Lakes basin south into Mississippi River drainage to Louisiana and in some Gulf Coast drainages with some declines throughout its range. Lately it has become increasingly more difficult to find with many occurrences represented by few individuals, often without evidence of recruitment. Comments: The black sandshell resembles the yellow sandshell in shape, however, it gets larger, darker, has a straighter dorsal margin and is less inflated than the yellow sandshell. 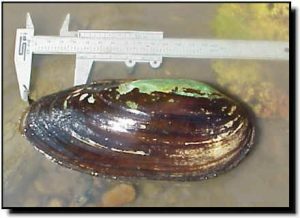 This mussel is sexually dimorphic with the female more inflated near the posterior margin. 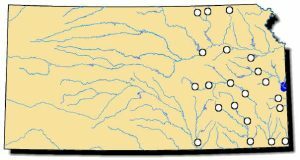 The black sandshell does not have a viable population in Kansas, but it was considered common in southeast Kansas rivers in the early 1900s. Bleached, white relic shells are found along many gravel bars as evidence of its past existence. An old, living male specimen was found in the Marais des Cygnes River in 2001. However, no others have been located, even after extensive surveys at other suitable sites. The black sandshell is typically found in clear streams with stable gravel substrate. Because of its elongated shell and bright nacre, it was utilized for inlay work on pearl handled knives. When the female is gravid, she displays a brilliant pulsating white lure to attract a host fish.